I was thinking of these posts by Baron Barnett and considered my own experience about five years ago when I bought my first firearm. Needless to say, I soon started to make up for lost time. About 40 years of lost time. I had always been pro-gun, but didn’t really get liberty until I left that socialist hell hole up in the Northeast. (Sorry, JayG, I don’t mean to rub it in.) How many? More than I need, not as many as I want. After all, last I checked, the first ten amendments to the Constitution were referred to as the Bill of Rights, not the Bill of Needs. So in late 2006 or early 2007, I got the news that my sister had been mugged. She lives in another Northeast socialist paradise (New Jersey), and though her husband is a retired police officer and usually carries, I don’t think she has even ever touched a gun. It was dark, but the parking lot wasn’t really poorly lit and she had parked fairly close to the hotel lobby entrance. She had gone back to her car before entering the hotel to retrieve something, and there was this 6-foot plus thug standing right next to her pinning her between him and, the open door of her car, and the car next to hers. Without a word, he simply grabbed her purse. But my sister, being unwilling to give in so easily, would not let go of the purse. The mugger proceeded to drag her until she let go. Scrapped up knees and an injured right hand later, she wound up having multiple surgeries to repair damage to her hand. It’s still not 100%, but at least functional. If I hadn’t already initiated the process to get my NC CHL and buy my first gun, I would have done it right then. In fact, I remember saying out loud to a friend, “that does it, I’m getting my conceal carry license,” even though I had already started in that direction. My sister was violently attacked, but, fortunately, wasn’t killed. At the moment of her attack, there was no way for her to know whether or not she was going to make it through the ordeal alive. If statists in control of New Jersey hadn’t made it so difficult for her to keep and bear arms, and she was carrying and managed to stop the attack, possibly resulting in the death of her assailant, would CSGV, The Brady Campaign, and company have considered him a victim of gun violence? Let me be clear. He would not have been a victim. He was the perpetrator, and should he have perished in that encounter, no matter the means, it would have been due to his own actions. And all you have to do is read a week of Sean’s posts to come to the conclusion that he’s likely a multiple law breaker that should have been behind bars, and may soon meet his demise, anyhow. How many victims must he rack up before it’s Too Many Victims? I’m not at all advocating that he should simply be killed, indiscriminantly, but that, one way or another, he should be taken off the streets to prevent him from creating yet more victims. We can’t get to that world because of what I call the Four Horseman of Human Havoc — Angry, Hungry, Stupid and Wicked. Oh, we might be able to solve Hungry someday, but the other three? And that’s the rub. Until there is a fundamental change in human nature, the good guys need the guns to protect themselves from the bad guys. That’s why you have all those armed people in the room, right? No one disagreed. If guns suddenly disappeared, the good guys would have to invent them all over again. That’s because Guns Protect You. A gun death is no worse than a non-gun death. A death is a death. And if those who hate guns so much were really concerned about the number of deaths in this country, they ought to be going after automobiles, given that about 50% more people die from their use (even though there are, from many sources, more guns than cars in the US), than do from guns. But even that would be a failed effort. Why? Because it focuses on the object, rather than the operator of the object. As Kurt Hofmann said, [T]here is as much nobility in being despised by the despicable as there is in being admired by the admirable. Barron Barnett posted today that it is a badge of honor to have our effort to participate in the vigil they called for (in memory of the victims of gun violence — note that it seems that the victims of violence not carried out with guns don’t seem to mean much to them) called offensive. I agree, and it is despicable that those who hate guns are so willing to dance in the blood of victims of criminals before the blood has dried on the pavement to further their agenda of control. WE honored the victims of ALL violence and added that we will not ourselves be victims, and every day we encourage others to take responsibility for their own safety, and we are appreciated when we do. Stick that in your candelabra and light it. Doing my part to put an end to violence in my world. My contribution to Weerd Beard’s idea. Full size Rock Island in .45 ACP, two spare 8 round mags with one in the pipe (for 25 rounds total) carried in a BlackHawk Standard CQC holster and BlackHawk mag holders. 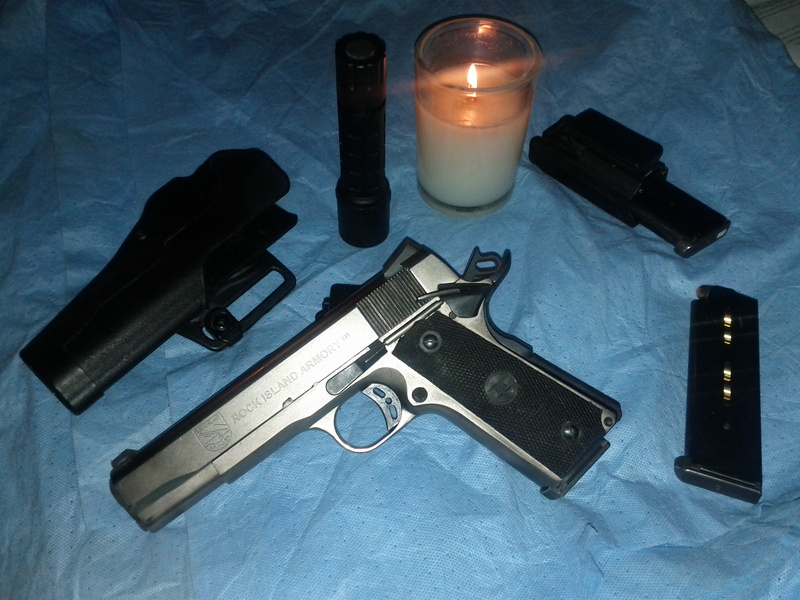 The SureFire flashlight is a backup for the candle. Go to Weerd’s link above or Jay’s if you don’t have your own blog and want someplace to have yours posted. Via Unc, this is the kind of thing that makes one feel like a fool for putting up with low 120 degrees for hot water heaters, toilets that don’t flush, showers that don’t spray, and detergents that don’t clean. I’ve already started adding TSP to my dish detergent with only marginal improvement. I’ll be following Unc to see what recipes he’s used and how they worked. But one thing I will definitely be doing as soon as I get the chance is turning up the temperature of my water heater. Heck, I may go to 135 or 140, but I’ll start at 130 to see how that goes. Sticking my finger in the eye of Leviathan is satisfying. Especially since it annoys the busybodies. h/t Knitebane for the heads up on Unc’s post. The Republican National Committee has sent me a (second) 2012 Presidental Platform Survey that is so bereft of understanding of the threats that our republic faces that the RNC should give up the “Republican” name for good. This survey is so important to the RNC, that it is REGISTERED (OMG!) to my name and address. Oh, no, it gets worse! I have been DESIGNATED REPRESENTATIVE OF VOTERS residing in my district. Lest you think I’m CAPS KEY happy, the CAPS are in the original. Nearly all of the 34 questions are either the wrong questions to be asking, or they shouldn’t be yes/no questions, which they all are. The nature of this survey makes it abundantly clear that the GOP leadership thinks that wishing away 2010 will actually make it go away. Robert Spencer has said — though I don’t know if it originated with him — that Hamas is the fast jihad and Fatah is the slow jihad. Same end goals, different tactics. I assert that the Ds are fast socialism and the Rs are slow socialism. Same end goals, different tactics. I’m going to have some fun with this survey. I doubt it will do much good other than some venting for me. But, Michelle Malkin ran a series of RNC rejection of the day articles and I have to wonder how many they got. I do hope that it contributes to scaring the pants off those of the permanent political class regarding their political futures. Or perhaps more. I’ll post my comments on this survey when I’ve marked it up. Sarah Palin as the head of the RNC. Now there’s an awesome idea, sure to cause more than a few heart attacks among the CBC. So, on the urging of Sean I signed up for the March 24-25, 2012 Appleseed event. I had tentatively planned to go last November, but a number of things came up and I wasn’t able to go. But I did take the time before that to upgrade my 10/22 to a Liberty Training Rifle, in addition to replacing some of the parts with Volquartsen alternatives (hammer, trigger, bolt release, and, soon, the firing pin). I’m actually still getting about one FTF per 100 rounds and I’m hoping the new firing pin (already ordered) will resolve the problem. Ammo doesn’t seem to matter, as I’ve tried a number of different brands and types with similar results. I know there are wide and varied opinions of Appleseed, but I’m willing to give it a shot (sorry) myself and highly doubt there can be anything damaging about it. At least not for me with a few years of shooting under my belt already, having participated in Vintage Rifle Matches where I’ve gotten a lot of one-on-one help from several more than willing experienced shooters, most of them former or currently serving military. I’ll plan on doing a review of the experience, so watch this space in late March for my report. I’m getting this under the wire, but I wanted to wish any readers out there a happy new year, and also expound a little on what I hope for in the new year. I’ve never been much for new years resolutions, but after reading David’s article on New Year’s gun rights resolutions, and listening to the sermon my pastor gave this morning, I’m going to break with the tradition and make a few commitments. I’m dividing them into four categories and if I can make progress with at least one of the four every week, I will consider it a success. I will still aim for progress in at least one every day, but I want to make a commitment I’m sure I can keep. So I’ll start with one step of progress a week. First area I will be working on is what I’m calling Prayer. But I’m really referring to a much more broad topic. What I want to do is deal with some personal demons of mine more seriously. In tough times, which I believe are coming for this country, and this world, having a ball and chain of conscience can be a great hinderance to survival, even if it’s just emotional and spiritual survival we’re talking about. Whatever I write here regarding this will be in general terms, of course, but I think it’s important at least to mention progress and I hope it encourages others, as well. Second, I want do something for the cause of Liberty in general. A recent is example is my letter to Richard Burr regarding the TSA. Letters to the editors, calling or meeting with congress critters, filling out a contact form to tell a sheriff to stop abusing his power are all important to this effort. Participating in a Tea Party event or even just having a constructive conversation with someone with a bit less understand of what it means to be free. I won’t be cutting off any arms while declaring “Tell Xerces he faces free men here,” Stelios style, but hope to have anecdotes of facing down wannabe tyrants. Third, though I have been preparing for some form of collapse to some degree, it’s been quite haphazard Preparedness. There’s been no organized thinking to my prepping. I think one of the first things I will do is go buy some waterproof matches, pay in cash, and demand privacy after being asked by a wannabe Judenrat sales dweeb what I’m up to. Face it: we’re all on those much feared lists, anyhow. And besides, hmpf, lists. Why is it that people think the government is the only one with lists? Lastly, I will step up and organize my efforts at the county, state, and federal level to turn back the tide of infringements on the Human Right to Keep and Bear Arms that has been marching along at least since the Jim Crow era. This also includes some of the ideas presented by David Codrea at the article above and the addendum by Dave Workman: Follow Fast & Furious to the end. So that’s my list for this year. I’ll do my best to accomplish at least one thing from one of the four categories per week, but will work hard to make that per day. I have a hunch this year is going to be one hell of a ride.